In 2012 the UK exported 320,000 tonnes of pork, 264 million eggs, 466 million litres of milk and 38,000 tonnes of butter. In the same year, the UK imported 696,000 tonnes of pork, 4,290 million eggs, 129 million litres of milk and 69,000 tonnes of butter. Does anything strike you about these statistics? That’s right. What the figures show (apart from the fact that the UK is importing far more than it exports) is that we seem to be exporting exactly the same foodstuffs that we are importing. This peculiar see-saw pattern of seemingly unnecessary import and export is not confined to the UK: the export and import statistics of other developed countries reveal the same strange phenomenon. Nor is it simply confined to the foodstuffs I’ve quoted. It applies similarly to foods like cereals, fruit and vegetables. At face value these figures would seem to provide evidence of some bizarre, convoluted economic logic. But what they actually reveal is how far we have become divorced from the notion of seasonality, exemplified by the way our supermarkets fill their shelves with the same produce day in and day out, all year round. In the case of lamb, for example, a closer inspection of the import/export figures reveals that the UK imports lamb, mostly from New Zealand, outside of the British lambing season. Then the UK exports lamb when it is in season here. We consumers (most of whom never bother to read the lable of origin on what we buy) are none the wiser, we just think of lamb, like apples and strawberries, as an all-year round product. But it isn’t vital for us to eat lamb all year round, any more than it is for us to eat asparagus from Peru in November or sugar snap peas from Guatemala in January. By failing to follow the seasons and failing to appreciate what we produce locally we end up consuming, without much thought, produce that is often inferior and which in some cases has travelled half way round the world to get here. Time for a recipe, and one which has some historic connection to the concept of seasonality. We will soon be entering that period of the growing calendar that was once known as the “hungry gap”, when our forebears had to rely heavily upon foraged foods and stored produce to survive until the first of the new season’s crops emerged. One such stored foodstuff is dried pulses. These are what nature provides when we leave our leguminous vegetables to mature and dry, rather than eating them when they are young and fresh. The resulting dried beans, each one a little powerhouse of nutrition, will grow into plants the following season if they are planted. But when they are cooked they provide an important source of protein. They are also low in fat and cholesterol but rich in potassium, iron, magnesium and manganese. 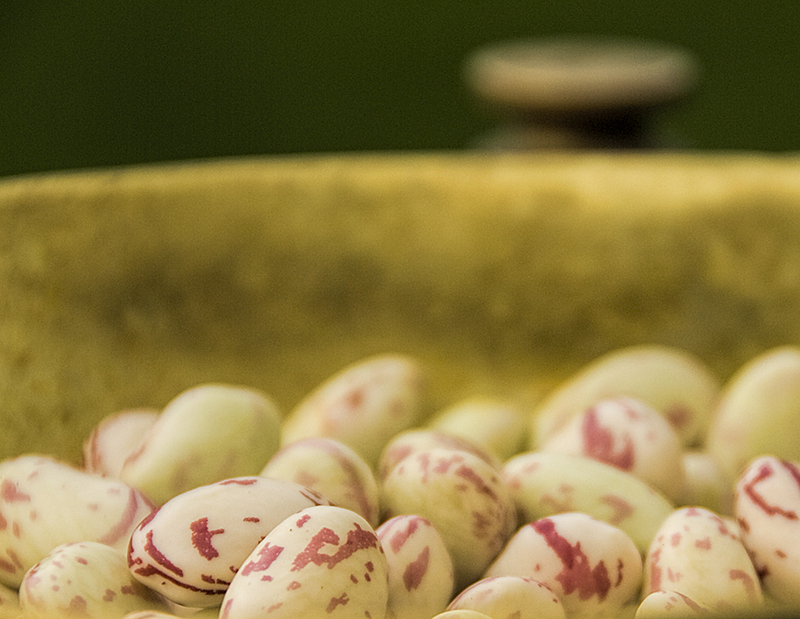 Borlotti beans (also known as cranberry beans) add a lovely splash of colour on my allotment plot, the Circus Garden, first as flowers then as mottled cream and burgundy pods. 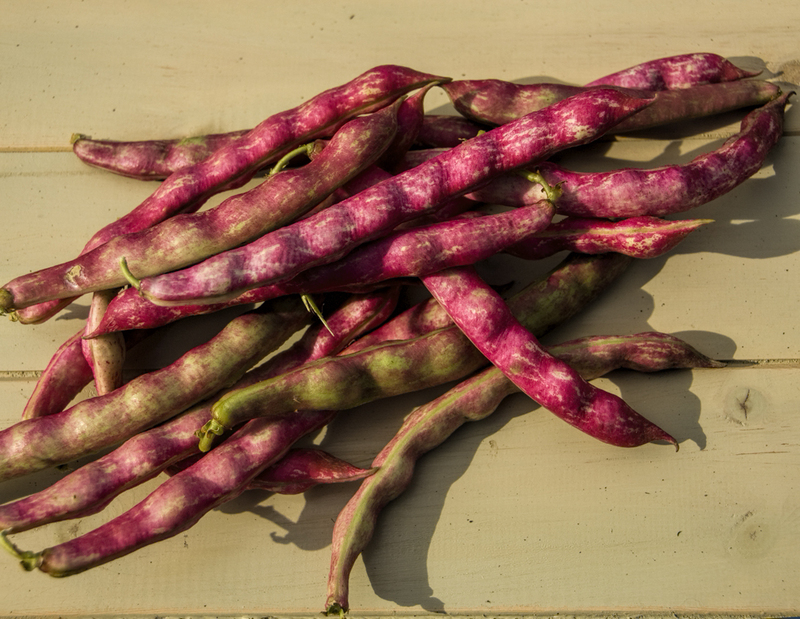 Inside are the individual Borlotti beans, like miniature works of art. No two are identical, but each is perfect in its uniqueness. You could, of course, make this recipe even quicker by using canned Borlotti beans, but they won’t taste as good as ones you have lovingly grown and admired, handpicked, dried and then cooked. 1. Drain the soaked beans and place in a pan covered with freshwater. Bring to the boil then reduce heat to low and simmer for 45 minutes or until the beans are tender. Drain and refresh under cold water. Set to one side. 2. Preheat the oven to 130°C. Bring the vegetable stock to the boil. Immediately remove from the heat and add the dried porcini. Leave to soak for 20 minutes. 3. Put the hazelnuts on a baking sheet and place in the preheated oven for 10 minutes, or until the nuts turn golden brown. Keep checking to make sure they don’t burn. Remove from the oven and, when cool enough, rub the roasted nuts in a tea towel to remove their skins. This is a slow process and don’t worry if you are unable to remove all of the skin. Blitz the hazelnuts to a powder in a mini chopper or equivalent. 4. Pour the oil into a large frying pan over a medium heat. When hot, add the onions and reduce the heat to low. Cook for 10 minutes, stirring regularly, until the onions are very soft. Add the garlic and continue to cook, stirring, for another five minutes. Next, add the blitzed hazelnuts, the chilli, salt, black pepper, the porcini with their soaking stock, the sage, parsley and thyme. Stir to combine all of the ingredients and remove from the heat. Set aside to cool for 10 minutes. 5. Place the cooked beans in a food processor. Add the lemon juice and zest and process to a thick paste. Add the onion, hazelnut and porcini mixture and process until fully blended, by which time it will have a thick, creamy texture. Serve as a starter or a light lunch with wholemeal toast and a light salad. It seems like an very nice recipe, I will definitely try that one. Just a request : please could you give me the references for the figures mentioned above about UK and other countries import and export ? I would like to know a little more about that subject. Thanks a lot. Hi, and thanks for your comments on the recipe. The import/export figures I quoted were obtained from various UK government published sources, principally Defra reports, but it took a fair amount of research to get them as they are not all in one place. Came looking for a stir fry sauce and found the solution to my Xmas pâté woes 😂 👍 I’m not a meat pâté eater but I love porcini so I’m sure this go down a treat!